Sonorous PL2200 review | What Hi-Fi? Sonorous didn't fare too well with the N110 rack which we have previously tested, it being criticised for poor build quality and weak performance at £1000. This second rack's competitive price, good looks and decent features, however, mean it does much better overall. 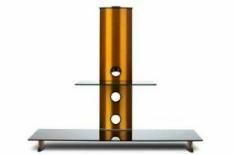 For your £280 you get a bottom shelf able to hold two standard-sized pieces of equipment, a top shelf perfect for a centre speaker, and a bracket that sticks out of the orange neck for mounting a flatscreen TV up to 37in. There's also a simple but effective cable management channel, basic wheels on the feet, and a wide swivel to the TV bracket. As you can see from the picture, it's good looking too, and yes, you can opt for a colour other than orange if you like. In fact, choosing any of the other five colours available will save you £20. You can also specify clear-glass shelves instead of piano-black ones. So-far, so-good, but it's not without flaws. The first is that building the unit is more fiddly than it should be and the instructions could be a lot more clear. It's also fair to say that some parts (particularly the feet) don't fit together quite as flush as they should, leaving occasional ridges on what should be smooth edges. Also, once constructed, the PL2200 isn't quite as rigid as it could be, and the metal neck feels a little cheap. Rival racks from the likes of Atacama and Partington certainly feel a lot more solid. This slight lack of rigidity comes through in the performance. Although the Sonorous is good at conveying the excitement and bite of a music track, it's also guilty of injecting a touch of brightness. This is by no means catastrophic though, and in general the PL2200 admirably avoids colouring the sound or vision presentation. If you're after the last-word in performance, the Atacama and Partington racks fair much better, but they're very expensive compared to the PL2200, and one might argue that they don't look as nice, either. So, if you want a stylish, flexible and feature-heavy rack and don't want to pay the earth for it, the Sonorous is well worth an audition.